I wonder what is the optimal spring floor for Judo? Let's say you have a concrete floor and, want to go further than just laying the tatami, or flexi-roll on that. I've read about and, practiced upon sub-floors made of tires and, foam blocks. I've seen gymnastics floors with real steel coil springs underneath. What is the optimal floor for long term Judo practice? What do they use in Japan, at the Kodokan? Do they use steel coil springs, or some type of wooden spring floor, like many old dance halls once had. What is the best floor to go under the tatami? Re: The optimal spring floor for Judo, or What goes under the tatami? This is a good question. It has been asked before and the information is too little commonly known. I have made a folder on my computer to compose a scholarly papers on this matter as from responses previously given I can only derive that the facts are not generally know. With facts I mean the hard data and parameters that actually measure and explain the differences and that can be compared. Too often the responses boil down to "this is how we've done it and it's awesome and the best floor in the world" (... says the jûdôka who is a yellow belt and has visited two local dôjô in his entire life). To the best of my knowledge there exist only one Western jûdô federation which had taken things seriously and actually published standards for different approaches, and that is the FFJDA. They actually have a pdf-booklet that explains those standards. There do exist dôjô in the West which have a decent floor but many of these are pretty old since with today's standards it would be an expensive job to make such a floor. The biggest problem though as with so much in jûdô is that people simply lack the knowledge, so they start guessing or experimenting, or copying in some way what they think is or needs to be done. This is also the reason that I said that there is a need for these procedures to be put together so that the knowledge is available in Western languages. Some time ago, at the beginning of this new forum I wrote a post in which I tried to briefly explain some of these principles, but it was as is often the case, met with anger particularly by those who had built a tatami floor that lacked these standards. I realize it's a tough job, but that doesn't mean people can't at least be explained what these standards are and how to achieve them. In essence, what happens is that the concept of the tatami floor is part of the building plans. It is not normally "added afterwards". The concrete floor needs to be poured lower than what your final floor would be, so it is actually a sunk floor. When the concrete is floored at calculated intervals cardboard cilinders are constructed that are filled with concrete. The end product is then a concrete floor from which concrete cilinders pop up, for example 20-30 cm high. The top of those cilinders still remains considerably below what will become the final surface. On top of those cilinders steel coil springs are added are installed. On top of those coils, a wooden frame work is added that rests on the steel coil springs. There are two ways of creating the wooden frame work. You either have a two-layer framework or a single-layer framework. In the two-layer framework, the wooden bars that go in one direction are on top of those going into the other direction. This is preferred, but it means that the wooden framework will be thicker than when using single layer. In a single-layer framework, openings are made into the wooden bars that run in one direction, and those that go into the other direction have there ends are inserted into the other wooden bars. On top of that wooden framework your floor is laid, i.e. wooden planks running in one direction. So basically, your floor rests on a wooden floor, on steel coils and on concrete pilar leaving below a considerable space that may well be 60 cm deep. Then, on the floor surroundings, a wooden rim is created that will hold the tatami in place. In between that wooden rim an tatami, a strip of tatami-colored foam is added that can be compressed allowing the tatami being perfectly in place and preventing that the tatami is chafed off from moving against the rim when the floor moves. The tatami themselves are a challenge too. At present, to the best of my knowledge there is no shop in the West where you can acquire actual Japanese jûdô tatami. Buying them from Japan is an expensive job due to customs charges and transportation. Proper tatami are constructed of layers of different substances of different density. Using special equipment they are then sewn and glued. There also exist special tatami built for putting them directly on a concrete floor. The effect is obviously not the same as with a proper floor. Those tatami are like 7 inches thick and very heavy and I know of no dôjô that has them. Inside those tatami also a wooden layer resting on engineered layers, with other layers on top. The tatami sold in the West as jûdô tatami are cheap fake copies that have a single layer of polyurethane in them. They are put into a piece of canvas that then is simply glued together, not sewn as they don't have the equipment or technology in the West. There used to be a company in Germany that had an alternative floor in its catalogue, but I am speaking of the beginning of the 1980s. Since very few dôjô are purpose built in the West, one needs a system that is built on an existing floor. That means your floor will be up rather than equal to the normal floor height. Our old dôjô was like that and was built on instructions received from Abe Ichirô. There are no companies anymore that produce them in the West. Even for gymnastics they are very hard to find. As far as I know the only ones that sometimes still do are for cheerleading floors. The gymnastics floors, like the commercially available jûdô floors in the West have switched to foam blocks. It's much cheaper and much simpler, but the effect is by far not comparable. The standards explained by the FFJDA as the best alternative to steel coil spring floors, use a combination of foam blocks and rubber blocks. There standards provide detailed indications in terms of measurements. There are several companies in France, Germany, and the UK who have them and they are similar to the gymnastic floors, but they remain cheap alternatives. 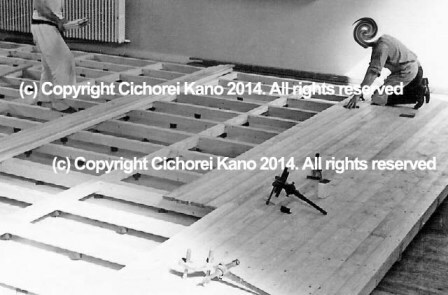 They also do not use individual planks, but use wooden plates with foam glued to it that are then locked together. It's something that every idiot can do himself with the help of a couple of mates. The proper wooden floors I described above though are also perfect floors (with the tatami removed) for karate, kendô and iaidô, whereas the cheap foam block wooden plates floors aren't really. They aren't properly finished to be used as naked floors, although technically you could put nice wooden planks on it too. The big problem with the foam block and FFJDA alternatives is that it is still unknown how well they will stand time. The rubber is likely to decay and not respond well to changes in heat, cold and humidity. It may smell. The foam my host bacteria and other stuff. The steel coils really could only rust if it gets really humid, but even that little affects their functionality. I've argued with idiots here who think that tatami just goes onto a floorcand ta-da a proper judo hall. When I comment that it's unsuitable for nage komi the typical response is "people shoukd learn how to fall properly". Strangely enough when I ask them what does a Jap university judo floor feel like the same people comment that it feels bouncy. I've trained in Russia and the mats they use there are very thick rubber, far moreso than I've seen in Australia. In line with the above look up how gymnastics floors are made, they cost around 40k to properly construct but then you get to throw and get thrown to your hearts delight. I've done wrestling practice on these before and you can repetitively take big falls and walk away smiling. Thank you. I learned a lot of useful information. You mentioned the two layers of wooden bars going in different directions. Are they perpendicular to one another, or am I missing something? All I can think of is a wooden floor, with long boards going east to west and, another layer on top going north to south. I have found some gymnastic companies that still sell steel spring sub floors. Since most people don't have the money to build a such a building, what do you purchase if you're starting on a concrete floor? How about a gymnastic steel spring floor attached to two layers of plywood and, the best quality tatami mats you can find domestically? Ricebale wrote: I've argued with idiots here who think that tatami just goes onto a floorcand ta-da a proper judo hall. I've been thrown on a wrestling mat, placed on concrete. I think I always fell properly, but my body landed with a thud, rather than any bounce. The whole "placed on concrete" thing is that whilst the mat will absorb a lot of the impact, and wrestling mats are better for falls btw, the better the surface and undersurface the more throws you can get in with a partner. More throws equals better throws via muscle memory, good falls help but in a competition of a good faller faller vs a good thrower the good thrower will prevail under the Judo definitions of victory IMO. Mr_Michael_or_Mike wrote: Thank you. I learned a lot of useful information. You mentioned the two layers of wooden bars going in different directions. Are they perpendicular to one another, or am I missing something? All I can think of is a wooden floor, with long boards going east to west and, another layer on top going north to south. My old dôjô (one of which I am currently the Chief-Instructor) had constructed one like that, with the floor built in the 1955s. The floor is still there, with pigeon faeces covering the nice wood unfortunately, in a building that is now defunct. I don't have the drawings, and they are not in the club archive. They are likely lost forever. However, there are still several black and white pictures of its construction in different stages. Although it was our plan to deconstruct the floor and rebuild it in our new dôjô that plan was never realized. However, the steel springs, it seems are alternated with rubber blocks, and the steel springs obviously need some kind of support in which they rest and that is flat so it can rest on the floor. In our case, the steel springs were obtained from I think certain used transport vehicles, I am not sure. My teacher, who passed away last year, did specify it at the time when I was still a young jûdô student but I can't exactly remember. The wood was simply obtained from a lumber store. Unless you know the compression and rebound rates of the springs, you will be just guessing and may end up with bad results. Those rates need to be matched to the tatami or whatever kind of mats you use. We have had good results with our foam block supported floor on concrete, two layers of plywood at right angles, and modern tatami (the bonded foam type). My understanding is that the foam blocks available are matched in compressiona rebound rate, more or less, to the type of tatami we use and that are commonly available. There was/were an article on the old judoforum that gave where to get the foam blocks, and alternate construction plans. We followed the plans and they worked. Our floor is vented as well for circulation around the outside edges. It is one of if not the best floors I have done Judo on, with no bounce (as the springy gymnastic floors have...they also are softer than tatami used commonly at judo shai, but nice to fall on!). The floor absorbs impact VERY well. I'm not a yellow belt either. I've not been to the Kodokan with it's spring loaded floor, though, I admit. Tires are not optimal, either. Anyone doing judo on mats on concrete is asking for trouble. Same for shiai that lay mats on unfloated gym floors or concrete floors. It is still all too common though. For an ideal tatami indeed the physical parameters of all materials involved need to be known and taken into account, but this applies to whatever material used for resilience, whether springs, steel or hydraulic, foam blocks, rubber blocks, or rubber tires. In practice this is generally not done for floors built by amateurs. when my teacher built our spring floor, no civil engineers or physics professors or biomechanists were involved and I doubt that there were any when Fukuda's dôjô or the Seattle dôjô was built. In the case of springs, excessive bouncing rate are reduced by alternating springs with rubber blocks so that it impossible for one area to be compressed below a certain depth. Adjusting can also be partly achieved by the number of springs used and the distance between each of them. The steel springs that are sold as part of the commercially available cheerleading floors (which I know are still in production) or (apparently) for gymnastics (which the original poster apparently has located somewhere) presumably are the product of extensive testing and experiences. These companies will have samples but also addresses of places where they have installed these floors in order to allow people without an extensive scholarly or physics background to subjectively go test out these floors and make remarks in terms of wanting a more or less bouncy floor. The number of people who work out on such a floor is also a parameter. On a gym floor generally one person is demonstrating, but on a cheer leaders or judo floor multiple people are working at the same time. Anyone interested in detailed descriptions has to be patient. When I complete the article it will contain detailed pictures as well as all the physics parameters involved, how to actually measure all these parameters so that one has objective numbers to compare these. By the way, believe it or not but in France there actually exists a law that describes minimal characteristics of tatami and floors for judo and aikidô (Law or better Ministerial Decree of 10 May 1984). It deals with things such as the Material Energy Restitution Coefficient, etc. For those too impatient to wait for the article, people such as biomechanists Professsors Sacripanti from Italy and Francis Trilles from France have done some excellent work on the optimal characteristics of tatami and floors, and their papers and article are very informative. There also exist Japanese specialist papers, but given the difficulty of the topic and the language, I anticipate that for most people these are going to be of little use. To avoid subjectivity in outcomes, there exist devices that measure these parameters. They consist of a standardized mass that is attached to a column and to which an accelerometer is attached and that can be adjusted in height. The mass is then dropped from several heights on to the tatami and/or floor. The amount of compression, potential energy, restituted energy, lost energy, static constraints, impression, maximal deceleration, residual impression, contact time, maximal velocity upon impact, maximal velocity after initial impact, and all kinds of other objective parameters then can be measured and compared. Trilles F.: Les conditions matérielles de la pratique du judo [The material conditions of judo practice]. In: Optimisation de la performance sportive en judo [Optimisation of sportive performance in judo]. Brussels: De Boeck s.a.; 2010, p. 335-359 [in French]. Trilles F.: Etude des interactions judoka-tatami, optimisation du compromis performance protection et problématique d'une normalisation. Unpublished Thesis, Sciences et Techniques des Activités Physiques et Sportives (S.T.A.P.S. ), Faculté des Sciences du Sport, Poitiers, 1987 [in French]. 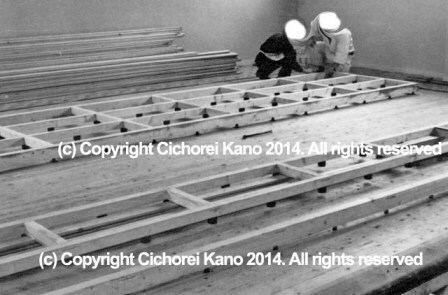 The above picture shows how first a wooden floor was installed over concrete and then the second floating floor on top. Parts of the single-layer frame work were then first put together, turned upside down and the steel spring coils attached. The above picture shows how the partial frames were turned back with the steel spring coils pointing to the bottom and then positioned in such a way a to put them together. In the back you can see the planks lying that go on top of the single-layer frame work. The above pictures shows how after the full single-layer frame work is in place, the individual planks are attached on top of it. It requires some planning, and some work, but quality requires time. If you're only willing to devote one Saturday afternoon to it, then don't go for it. I would like to point out that I didn't learn jûdô either by just spending a single Saturday afternoon, and I didn't learn Japanese by just spending a Saturday afternoon, nor did writing 14,000 posts on these JudoForums took me just one Saturday afternoon. If you want something decent, it requires time and effort, but it will pay off for the rest of your career. By the way, these pictures date from the late 1950s. The floor is still in place now 60 year later although our dôjô unfortunately had to move a couple of years ago. Through all these years it never required any maintenance and never deteriorated, and its floating characteristics are still as optimal as they used to be. I showed it last year to a number of people who wanted to see it. Of course, it is built on an existing floor and not sunk in the floor as one could in a purpose built dôjô, but very few have those in the West anyhow. Over 30 years of judo and I have only been to 3 dojo with sprung floors, and they were all different. One of the dojo has a seperate area with what they call a double sprung floor, specifically for nagekomi, lovely to land on but as you can fall without any breakfall I would imagaine it lead to some really bad habits. 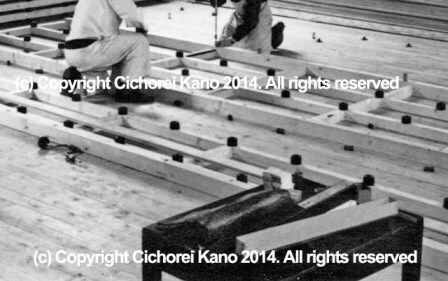 Cichorei Kano wrote: For an ideal tatami indeed the physical parameters of all materials involved need to be known and taken into account, but this applies to whatever material used for resilience, whether springs, steel or hydraulic, foam blocks, rubber blocks, or rubber tires. In practice this is generally not done for floors built by amateurs. when my teacher built our spring floor, no civil engineers or physics professors or biomechanists were involved and I doubt that there were any when Fukuda's dôjô or the Seattle dôjô was built. In the case of springs, excessive bouncing rate are reduced by alternating springs with rubber blocks so that it impossible for one area to be compressed below a certain depth. Adjusting can also be partly achieved by the number of springs used and the distance between each of them. Thank you very much for taking the time to make the detailed post. I had not idea of the complexity of some of the floating/sprung floor designs. I look forward to seeing your article on same. The administrator of our club is a licensed professional engineer (construction). I'll point him towards it when the article comes out. Our floor is holding up well so far, and certainly better than the tatami on concrete on which I will have to instruct judo in about 20 minutes. Thank you for that information. The photos and, link to the Austrian school help out greatly. Here are 5 companies that I've found. They all have coil springs and, I assume they are made of steel. I don't know about the compression/rebound rates, though. Mr_Michael_or_Mike wrote: Thank you for that information. The photos and, link to the Austrian school help out greatly. Thanks for these links. There are some which I did not know about. Sure, but you have to be careful for the things which Ben pointed out. I see in the first link, for example that they have springboards with steel coil springs. that is not the same though as a spring board is constructed in a different way. In the other links, yes, those are the systems that I knew about that were commercially available at least for cheerleading floors. Many of the commercially available gym floors now use foam blocks too because it is easier and cheaper, but I am glad to see that there are still more companies available than I thought which offer the spring coil alternative. You do need to test them out to see if reslience and movement are acceptable for judo and for multiple people. There are other things you need to test, such as noise. Spring floors squeak more than foam block-based floors. You may have such things that you jump up at one side of the floor and that it also moves at the other side. The birchwood plywood is the overall standard type of wood that is used these days for gym floors. In essence that is the same as with the foam blocks which are usually also attached to plywood. Be aware that this approach is still different from a Japanese jûdô floor where the springs are NOT attached to plywood plates but to a framework. There is still a difference. When attached to framework, the compression is more even, and distribtution of forces not identical. If you jump on one side of a plate it has the tendency to tilt and the other side pop up. Because the other side is attached there to another plate, you have a a point of stress there. With a framework the stresses are distributed more evenly and the tilting is less because the wooden bars are much longer, and for the side so far removed to be still move upwards that far does not so readily happen. Lots of complicated things, probably too confusing, so to keep it simple, contact some of these companies and see if they have installed such a floor anywhere in your neighborhood and or find some serious gym clubs and ask if they have such a floor and if you can come pay a visit and move around on it a couple of times. Finally, as a practical matter, and this is what will concern most clubs, do you have a budget that can afford these commercially available systems. At the end of the day there is a simple economic reason why people go with what they have ? Unless you have a sponsor or an owner or teacher with deep pockets, for most people jûdô is a sport that won't make your rich and is mostly done by ordinary people, not CEO's, millionaires or the typical population you find on a golf court. If you have someone who without blinking can and would be willing to give 30K, no problem, but if like so many in jûdô you have think in the range of $100 here and $100 there then commercially purchasing a floor may not be the wisest option. I have also seen companies who sell the foam block system, but my advice is if you want to go the foam block route then do as Ben did, and do not commercially acquire those, for the simple reason that I think you can build them a lot more economically than what those commercial businesses charge for them. I seem to recall reading on here (or the old JF?) about a school that converted an old roller skating rink to a judo dojo. I believe they used thousands of rubbery foam cubes over the concrete subfloor attached to 2 staggered layers of 7/16" plywood. I was incorrect, the dojo where we trained is on some sort of "floating" floor. Was decent to fall on. Even did nage komi without injuring ourselves. Good workout and a lot of fun for all involved ! Heisenberg wrote: I seem to recall reading on here (or the old JF?) about a school that converted an old roller skating rink to a judo dojo. I believe they used thousands of rubbery foam cubes over the concrete subfloor attached to 2 staggered layers of 7/16" plywood. This is similar to what we did at our dojo. Not sure as the exact materials that were used in the place for the link you posted. We also painted the top layer of ours to make it easier to clean when we take up the tatami. So how do you find the foam floor to break fall on? In the latter case, Vicks Vaporub is included in the club dues. It appears that the Japanese style tatami for Judo can be purchased in North America! The "Martial Art Tatami Mats (For Judo, Aikido Dojo): Made in Taiwan" look to be partially sewn on the side. This company sells several types of Japanese style Judo tatami. They also include cross sections, but no translation on what each layer is made from. Some of the tatami are described as chemical, which seems to mean synthetic. From the various cross section pictures, the white material might be synthetic foam, while the darker areas could be straw, or wood? All of the models seem to be stitched. In this image, they claim that "is the finest mat to export abroad" and, is "highest grade judo tatami mat." Here is another for comparison. Wow, would loved to have had those back in my days in Judo. While regular tatami was great a floor with a little give was nice too. Back in 1963-64 and again in 1968-69 I lived close to Wright-Patterson Air Base, OH and worked out at the Kittyhawk Judo Club. They had built a large wood framed floor that sat on a boat load of old used truck tires. The top was plywood and some soft layer of something and covered with a light canvas or similar material. That was a great floor to fall on. I've looked around on the internet and, found many sources for steel coil springs for industrial purposes. I'm sure someone could figure out which ones might be useful for a floor and, get some brackets to attack to a wood frame. Cover with some Baltic birch plywood, maybe two layers and, purchase some real Japanese tatami. You would have a real Judo floor!